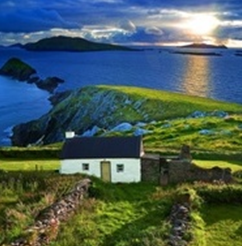 Lush and green, simple and unadorned, this three petaedl clover is known as the symbol of Ireland. Reputed to have mystic powers, the shamrock’s petals have been known to stand upright to warn of an approaching storm. In Celtic lore, the shamrock was used as a charm to ward off evil, thus its reputation for “good luck” was born, and continues today. 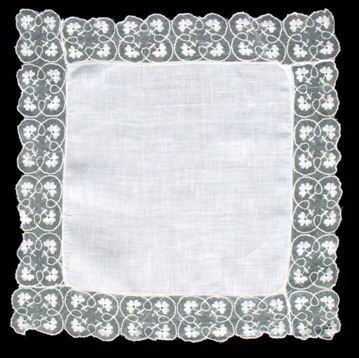 This linen hankie is bordered by a plethora of shamrocks, certain to bring the bride good luck! 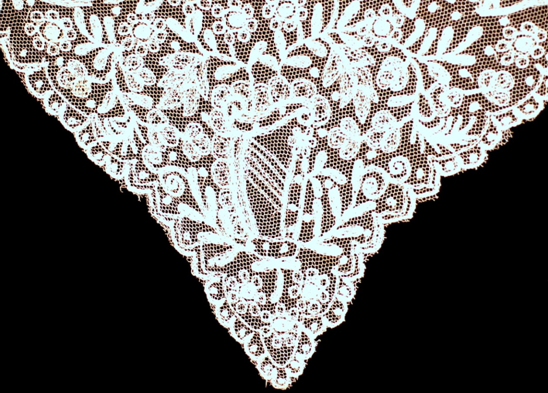 Note how the three leaf clover is encased in the outline of a four leaf clover – exceptionally good luck is wished on the bride. 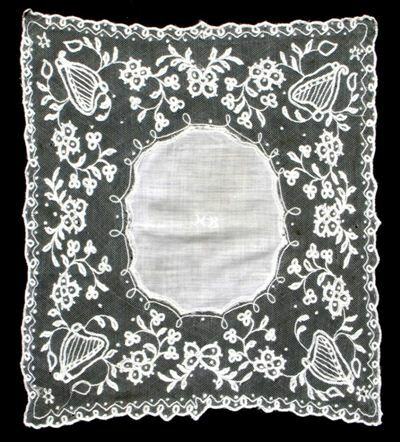 Formal and intricate, this handkerchief has an Irish Harp adorning all four corners, as well as shamrocks intertwined throughout, and the initials “HB” embroidered in the center. Ancient Legend says that the Gods gave the harpist music that could make men weep, music that brought joy, and music that lulled men to sleep. 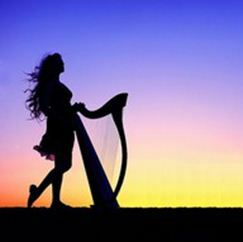 Thus, Celtic harps became known as the dispensers of sorrow, happiness, and rest. 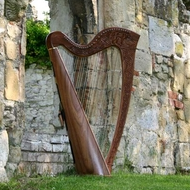 Until the end of the Middle Ages the Gaelic harp was the highest status musical instrument of both Scotland and Ireland, and harpists were amongst the most prestigious cultural figures amongst Irish and Scottish kings and chiefs. In the 16th century, King Henry VIII of England made the harp the official symbol of his new land by putting it on Ireland’s currency. 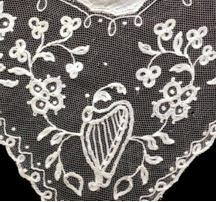 The harp appears on the coat of arms of Ireland as well as the flag of the Irish President. An image of a harp was even registered as the Guinness trademark in 1862. 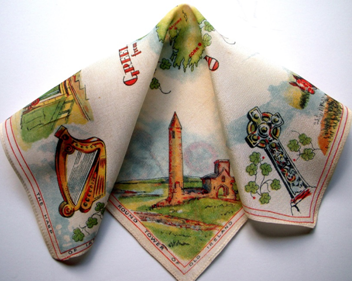 This silk souvenir handkerchief depicting famous sites has, not surprisingly, an Irish harp anchoring one corner, across from the ever popular Celtic cross. 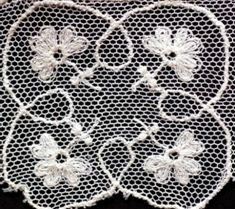 This intricate beauty also contains the Irish harp and shamrocks intertwined with delicate flowers. 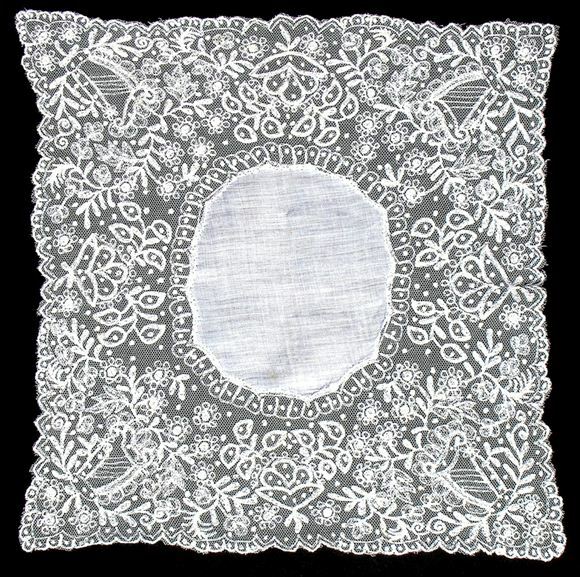 Lucky indeed the bride who received this as a gift on her wedding day. This is most assuredly an Heirloom to be passed down to future generations. May you get all your wishes but one, so you’ll always have something to strive for. No man ever wore a scarf as warm as his daughter’s arms around his neck. And be the lintel blessed. And bless each place of rest. 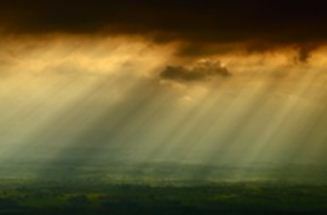 That lets the sunshine in. The peace of God on all.